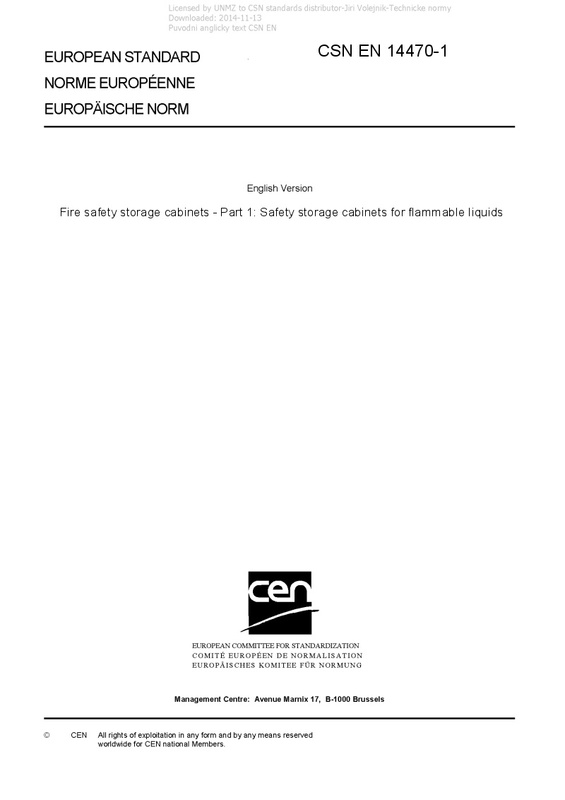 EN 14470-1 Fire safety storage cabinets - Part 1: Safety storage cabinets for flammable liquids - This European Standard is a product specification, giving performance requirements for fire safety cabinets to be used for the storage of flammable liquids in laboratories. It is applicable to cabinets with a total internal volume of not greater than 1 m3, which may be free standing, restrained to a wall or mounted on wheels or castors. It is not applicable to brick enclosures or walk-in storage rooms. This European Standard is not applicable to cabinets which do not take their weight on their base. Requirements are given in respect of the construction of the cabinet and its capacity to resist fire conditions on the outside. A classification of cabinets is given, according to the level of fire resistance offered, and a type test is included, which draws on already existing fire resistance tests, such as those given in ISO 834-1  and EN 1363-1. The tests described in this European Standard are type tests. NOTE 1 This European Standard does not discriminate between different flammable liquids, which may have considerably different physical properties. The suitability of the standard in respect of any given flammable liquid should be ascertained by the user. NOTE 2 Attention is drawn to national regulations which may apply with regard to the storage of flammable liquids.